Perhaps this introduction will sound a little harsh to you, but the truth needs to be told, because too many good people are getting ripped off these days by buying fake "Russian Hair" all over the internet and ending up with a disaster on their hands. The hair on the picture below is from Moscow, Russia. But don't have one iota of a doubt that this is NOT Russian ethnicity hair. It might look great and feels fine and soft, but ONLY before a few washes, because it's acid processed, colored and silicone covered Asian hair from former Soviet Union Republics. collected by someone who is right on the money. Because of its superior quality, our hair extensions, wigs and toppers have increased in popularity so much that everybody wants to be a part of our Virgin Russian Hair® revolution that we have introduced to the worldwide e-commerce in 2003. But very few people actually specialize in this superior quality hair. The reason for this is that most online hair vendors cannot get this type of hair and don't understand the difference between our selected hair and the hair simply imported from Russia. 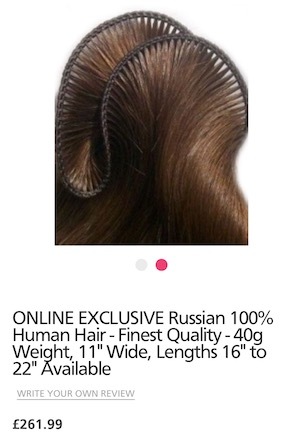 Most online sellers mistakenly imagine that if the hair is 100% human hair imported from Russian Federation, it must be what we call superior quality. 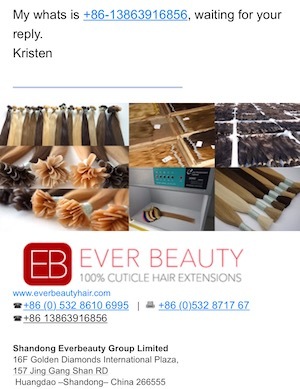 That's why by looking at our company, "everybody" is trying to sell hair by calling it "Russian Hair" these days, even those who have no idea what this quality hair looks and feels like. They simply lie to boost sales of whatever hair they sell. That's why this industry became so confusing - there are too many of online copycats who don't know what they are doing or misleading the consumer on purpose. When hair is sold as 100% Human Hair, be very cautious as this could mean a number of things. It is usually Asian/Indian hair, which is naturally black/very dark brown in color. When this hair is colored it takes on the consistency of straw. And as for blonde? Forget it! Never expect to get much time from this quality hair. Also, caution should be applied when using so-called "EUROPEAN HAIR", "EURO HAIR", "EUROPEAN QUALITY" or "100% EUROPEAN REMY HAIR". 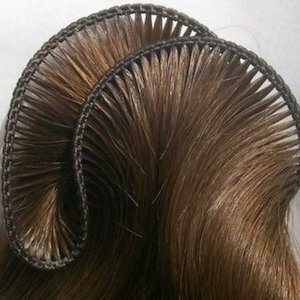 Silicone Oil treatment makes this type of hair to look "silky" at first, but invariably, this is NOT "European Hair"; it is hair that has been Acid Processed to be "Tangle Free" and to look like "European Hair". It is usually Asian/Indian hair and as stated before, will not last very long. To begin with the hair looks nice; but it has been coated with silicone oil to add shine and body to the hair. However, after a few washes the silicone layer starts to wash out. Then quickly the hair becomes duller and loses its sheen. It becomes brittle and dry. It starts to break down. Partially removed by acid reversed cuticle, originally covered by the silicone will become exposed which causes tangling and matting with your own hair . Every wash will worsen this condition. What you are then left with is acid treated Asian/Indian hair. If somebody offers you hair in varieties of colors at great "wholesale prices" - RUN, because it's acid processed Asian hair - GUARANTEED! Look at the picture below. This is where dishonest suppliers get their hair and call it "Russian"! A lot of CAUTION should be applied when shopping for hair online! Have you ever seen a warning "YOU CANNOT DYE OR BLEACH THIS HAIR"? 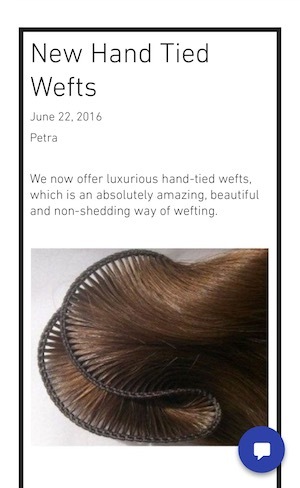 Well, that simply means that the hair you are about to buy was Acid Processed and Fabric Dyed (usually in China). Fabric dye on human hair cannot be stripped or re-colored. If you attempt to color or bleach that type of hair, it will turn into a green mess. Most of those vendors sell hair collected in neighboring Russia countries like Moldova, Uzbekistan, Kazakhstan, Georgia, Armenia... (former Soviet Union Republics) or simply hair from China. The hair from population of those countries is not even close to the "baby fine" texture of our hair. The texture of that hair is very similar to Indian, Chinese or Mongolian hair, sometimes even coarser. But a lot of hair vendors are trying to sell that hair as "Russian Hair" using an old Western mind stereotype that entire former Soviet Union is simply "Russia" and if the hair is from Russia it must be "Russian". Russia was just one of 15 Soviet Republics and hundreds of different ethnic groups live in Russian Federation these days. Beware of scams from Russia, Ukraine and Uzbekistan. Some of them use pretty pictures on their sites and ads all over the internet to get your money via Western Union or Bank Transfer. You will never get what you have ordered and there is no way to get your money back! Be careful when buying “Caucasian Hair“. Westerner would think that “Caucasian” means “European”. But some online vendors conveniently use the word "Caucasian" to sell the hair from Caucasus Mountains region ( Former Soviet Republics such as Georgia, Armenia, etc.) advertised as "Russian~Caucasian" or "Russian~European" hair. The wording confusion is obvious, but by texture that "Caucasian" hair is not “European” at all, it is more like Asian hair, much thicker and coarser than true European hair. So, not all the hair imported from Russia is actually that expensive, rare hair that everybody is after. The real deal is that expensive hair collected by us ONLY from selected Russian ethnicity population. But you have to be an expert to do that, and our company is the expert. Some online sellers are trying to capitalize on the reputation of our superior quality hair. They infringe on our registered Trademarks to sell their "Brazilian", "Indian" or some other Hair Extensions. You can find websites like that spreading from Australia to United Kingdom and across the Oceans to Hawaii. Too bad the consumer gets fooled by "companies" like that, because all of them sell acid processed and dyed Asian hair that wasn't anywhere near the quality of our hair. Why do they copycat our company? Because our company is the company who introduced Russian Hair Extensions® to the West and is the first company EVER who in 2003 started to offer real, 100% natural hair from ethnic Russians to worldwide eCommerce. Before we came to the market, nobody even knew what the phrase Russian Hair Extensions® mean. 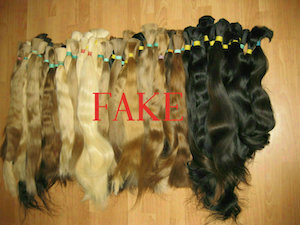 Remember these facts: "Cheap Wholesale" prices for the hair that matches our hair quality simply do NOT exist. There is NO such a thing as "Eastern Russian Hair", "Russian Grade Hair" or "Southern Russian Hair" - either the hair is Russian or it's not. Naturally black haired Russian Slavs are nowhere to be found in the Nature! If the hair is naturally black - it's not Russian! All that black hair that dishonest vendors claim to be "Russian" is from Uzbekistan and Kazakhstan (former Asian Soviet Republics). Uzbek hair is actually coarser than any Indian or Asian hair. Well, Uzbekistan and Kazakhstan are Asia. That doesn't mean that Uzbek or Kazakh hair is bad. It simply means that its texture doesn't match European heads. Beware of vendors who offer “Hair from Russia” in numerous varieties of artificial colors. Most likely it’s Indian/Asian hair or the hair from already mentioned above former Soviet Republics. That hair is acid processed for a temporary "European" silky texture and then fabric dyed to many colors, because during the texture processing, the cuticle and natural colors are stripped. Why it’s not real Russian hair? Because the supply of the Russian ethnicity hair is extremely limited, so it is impossible to color process that hair in the industrial way similar to huge quantities processing of Indian/Asian hair. Not to mention that during the color processing there is a 30% loss of hair. Imagine the cost of the final product if that would be real deal industrially color processed? Only cheap hair in huge quantities can be acid processed and colored that way. Besides, why would someone process and pre-color this very limited, precious, most expensive natural hair if the only reason why it is so expensive is almost non-existent availability of this hair in its natural state. Vendors who get get their hand real natural hair like this would never pre-color it because the demand for virgin hair from Russian Slavs is higher than supply. The supply this hair is not sufficient for an industrial coloring and the cost of such process with already very expensive raw hair cost would be astronomical. That is why well known hair extensions corporations with retail or "via hairdresser classes" distribution systems simply don't carry real natural Russian ethnicity hair, although they are pretending they do. So, if you see someone offers pre-colored hair, you can be sure that the hair you will get is industrially acid processed Asian/Indian hair. If you need a color that cannot be matched with our natural colors available, let your hairdresser to do a color job. That way you will be sure that you got the real thing and your quiet costly investment will last for a very long time! 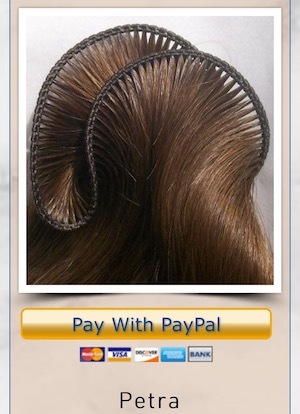 Please visit our Russian Hair Shop for some gorgeous hair!